Read more on the WSWS. 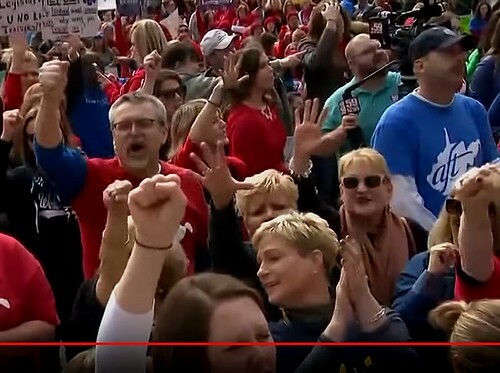 Every public school in the state is closed for a fourth day as thousands of teachers demand better pay, pensions, and healthcare. TRNN speaks to Dale Lee, president of the West Virginia Education Association, and union activist Lois Weiner. Striking teacher Jay O’Neal says the rank and file rejected a deal struck between union leaders and governor Jim Justice because it lacked concrete action on skyrocketing healthcare costs. This entry was posted in All Posts News Politics and-or Videos, Dandelion Salad Videos, Education, Health Care, Labor, Politics, Protests, Socialism and tagged Activism, Labor Unions, Single Payer Healthcare HR 676 S 703, Strike, West Virginia, West Virginia Teachers' Strike, Zac Corrigan. Bookmark the permalink.